This gorgeous quilt will wow your family and friends! During our 8 week course we will take you from start to finish! 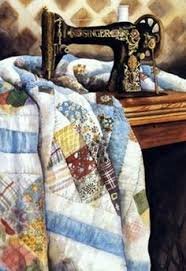 Learn about colour and how to choose fabric, proper cutting and measuring techniques, how to make 10 different pieced blocks, machine applique, how to add sashing and borders, then after all that you will learn to baste your quilt, machine quilt, attach binding and a label. WOW, what a great course!! Please call the store at 613-372-1972 to register.